Jose Antonio Garcia has become known as ‘The Pilgrim’ in his native country of Spain, after spending the last 11 years of his life walking over 100,000 kilometers to various pilgrimage sites on all continents except Oceania. This year, his amazing journey has finally come to an end. Born in Puerto de Santa María, in the Spanish province of Cadiz, Jose Antonio Garcia spent most of his life on water, working as a sailor. He wasn’t the most religious person, but after going through a near-death experience, he decided to dedicate his life to an epic pilgrimage to as many holy sites as he could walk to. In 1999, the fishing boat Jose was working on capsized off the coast of Norway, and he was the only survivor out of a crew of 17. He spent hours in the freezing water clinging to the bodies of two fellow sailors, and it was then that he turned to religion, vowing to the Virgen del Carmel, the patron of sailors, that he would walk to all of the world’s holy shrines, if she saved his life. Miraculously, Jose was found by a rescue team, but had to spend the next eight months in a hyperbaric chamber to recover from his injuries. But even after that long period of time, he was still unable to walk, and doctors were unsure that he would ever be able to use his legs again. Garcia spent the next two years in a wheelchair, and two more after that walking with crutches, but in the end, he was able to walk like a normal person again. And he never forgot the promise he made to the Virgen del Carmen when he was so close to death. As soon as he was back on his feet, he took out his life savings (around 36,000 euros), filled up a backpack with basic travel items, and left his home town to visit as many holy sites as he could. The first stop on his epic pilgrimage was Santiago de Compostela, in Galicia, where he visited the sanctuary of the Virgen Fatima. From there, he walked all the way to Rome, Italy, where he met Pope John Paul II, and dozens of other holy sites throughout the European continent. He then walked into Asia, through Turkey, visiting countries like Israel, Syria, Kazakhstan, Tibet and India. The Pilgrim then walked through Siberia and traversed Russia to pass into the North American continent through Alaska. He walked south, reaching Mexico and eventually passed into South America, stopping at as many religious sites as he could along the way. During the last 11 years, Jose Antonio Garcia walked on all continents except the Oceania region, visiting holy sites of multiple religions, including Buddhism, Islam and Christianity. 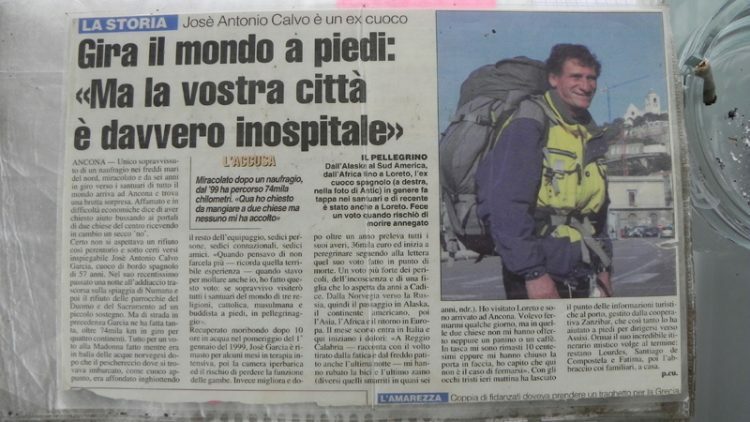 Even though he started off with 36,000 euros, he spent all of it during the first stages of his incredible pilgrimage, and ended up relying on the kindness of strangers for food, shelter an directions. In a 2014 interview with Viaje con Escalas, Jose said he was impressed with the generosity of people in poor countries, who know what real hunger feels like and are always willing to share what little food they have with someone in need. Speaking about his most noteworthy experiences on his pilgrimage, Garcia said that he will never forget the six months he spent living in a monastery in Lhasa, Tibet, nor his visit to the Bosnian town of Medjugorje, where the church uses all donations to rebuild the town. He calls it “a place where you can really feel the faith”. Regarding how his family feels about him being away for over a decade, Jose Antonio Garcia said that they are very supportive and proud. He thinks it’s both due to the nature of his journey and the fact that they are used to him being away for long periods of time. Ever since he started working as a sailor, in 1962, he has been away from home for at least six months a year. After walking over 107,000 kilometers around the world, visiting thousands of holy places and shrines, Jose Antonio Garcia is finally ready to return home, to Puerto de Santa María, where his daughter and grandchildren are waiting for him. At 67 year old, The Pilgrim feels that he has fulfilled his promise to the Virgen del Carmen, and is ready to dedicate the rest of his life to helping others.